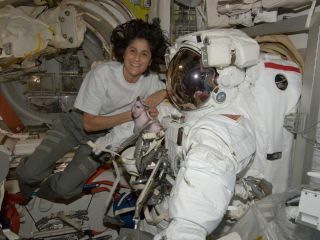 Astronaut Sunita Williams floating aboard the International Space Station. Williams has been selected to fly aboard Boeing's Starliner spacecraft. NEW YORK — NASA astronaut Sunita. "Suni" Williams has a way of bringing space down to Earth. On Sept. 22, Williams — a veteran of two long-duration spaceflights — talked to families and space enthusiasts about everything from cleaning toilets to facing tragedy in space at the Intrepid Air, Sea & Space Museum during the recent Space & Science Festival. Williams, who is set to be one of the first to fly aboard Boeing's Starliner spacecraft, was introduced by former NASA astronaut Mike Massimino and took to the stage aboard the Intrepid. "It's sort of cool to be on a ship," Williams remarked to the audience, which, she said, reminded her of her Navy background. Williams detailed the 322 days she's spent in space over the course of two missions. On her first mission, she was helping to build and complete the space station: "Essentially, I was a construction worker," she said. "We can't really call the repair guy, so we have to do it ourselves." Letting the audience in on the less-exciting side of being an astronaut, Williams spoke about how they have to clean and fix the toilet on the space station — "it's not all glamour work." Williams gave visitors a realistic look at what life is like as an astronaut. Aside from the upkeep that comes with living on the space station, she described how astronauts spend a lot of time doing scientific experiments, even on themselves; taking photos from inside the cupola; and completing spacewalks. Williams was not shy in confronting some of the real dangers of being an astronaut, either. She was in college when the Challenger disaster happened and, before she departed on her second mission, Williams lost a number of friends in the Columbia space shuttle disaster. A child in the audience asked if the Challenger and Columbia accidents affected her decision to go to space, and Williams responded, "Absolutely." "It brought to my attention [that spaceflight is] "pretty dangerous," she said. "This is not mundane." But while the tragedies made the grave dangers of spaceflight much more apparent, Williams said that she absolutely still wanted to go to space. Referencing the Columbia disaster and the friends that she lost, she said that "these people went to space knowing there's dangers. We want to continue their legacy and make what they did worthwhile." Williams will fly Boeing's Starliner spacecraft in the near future, continuing to bravely explore space. Williams' talk informed the all-ages audience, who came from all over to learn about space and science, about what life is really like as an astronaut. She encouraged the younger members of the audience to get involved in science and to get excited about space.